After getting over the initial shock of the positive pregnancy test and that I was pregnant and carrying our child we decided we needed to find out how far gone I actually was. After the midwife appointment on Friday 2nd December and not having the option for a scan, we really wanted to know how far we were into our pregnancy so we could tell our parents and see if it was going to interfere with our wedding day which was booked for July 2017. It didn’t matter if it did as our wedding could be moved around. We didn’t know how long we would have to wait for an appointment with the doctors/midwife so we did a little internet searching for “early pregnancy scans” when we got home that night and we found a few places to contact. I never knew there were options to have an early scan unless it was arranged by doctors or midwife for emergency reasons etc… how wrong I was. I was asked to lie on a bed and lift my top up and tuck some paper towel into the top of my trousers, gel was then applied to my tummy and a little pressure, it took a couple of seconds for it to appear on the screen, but there it was our tiny baby, it was amazing, so small, so incredible, watching a heartbeat, and seeing a tiny person growing inside of me, our baby. We could see it so clearly, the lady pointed out the heartbeat and we got to listen to the incredible moment of hearing it through the monitor, it was very fast but they said it was all normal, we could see it wriggling as well, it was so magical we both got a little tearful seeing our baby for the very first time. Then that was it, finished. We were 9 weeks gone, I was in shock as I had no signs and symptoms, no sickness or anything and I was pregnant. We were going to have a baby. 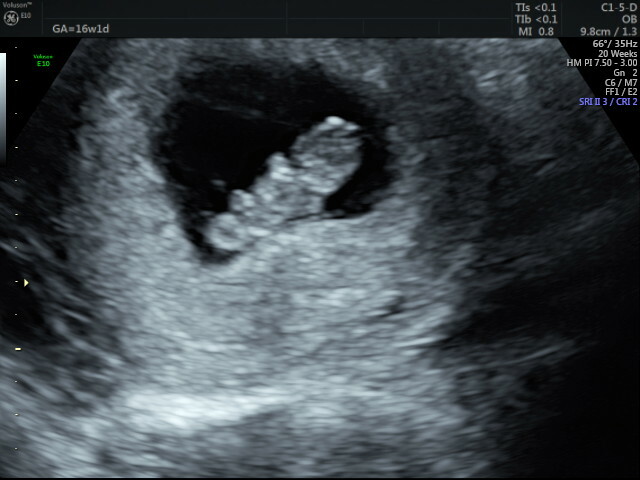 Here is our little squiggly at 9 weeks. They kindly put all the pictures on a USB stick for us and printed the pictures out too. Then it was the moment of telling our parents.